In the second installment of his thought-provoking and thoroughly enjoyable “Dissing Dogme” series (see here), Hugh Dellar addresses the touchy topic of language input in Dogme but this time Task-Based Learning (TBL) is also thrown in the mix. Why has TBL come under attack? There is no definitive model for task-based instruction and various models proposed by Scrivener, Skehan and Willis are slightly different. 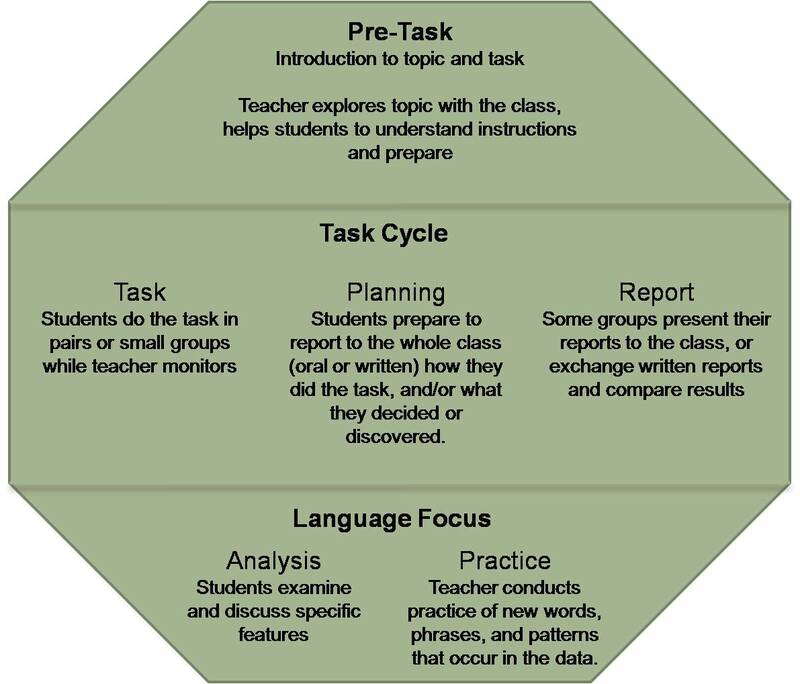 However, what they all have in common is more or less the same three stage structure: pre-task, task and post-task. The pre-task serves the same purpose as any other pre- (reading or listening) activity: it introduces the task – and this is one of Anthony Bruton’s issues with TBL: its similarity to skills based teaching. Note that this pre-stage can also include pre-teaching of some useful phrases and expressions which students may need later when performing the actual task. A task itself can include a very wide range of activities – and that’s another thing Anthony Bruton seems to take issue with. For example, David and Jane Willis suggest that processes involving listing, sorting, matching, problem-solving, sharing personal experiences to name but a few can all qualify as tasks. In the following post-task feedback stage the teacher points out specific problematic language features which arose during the task stage, highlights useful language, draws students’ attention to the gaps between their interlanguage and the target equivalent – all these are often described as consciousness-raising (CR) activities. Now – and this is important - this stage can be followed up by a repetition of the task or doing a similar task in which students are given the opportunity to improve their performance. Example 1: Describing a photograph. Pre-intermediate level - teen / adult learners. PRE-TASK: Show childhood photos of famous people / celebrities on the board to lead in to the topic. Ask students to guess who these people are. Teacher can also focus here on the mistakes students made, e.g. wrong past forms etc. REPEAT TASK: students change partners and repeat the task incorporating (hopefully) the language dealt with in the previous stage OR students upload their photos to the class blog and write brief informal descriptions. Example 2: Talking about a newspaper article. PRE-TASK: whole class watches 3 or 4 videos from Fox Business Brief http://video.foxbusiness.com (each one usually lasts under a minute) and discusses which news stories they find most interesting / relevant etc. Example 3: Creating an online poster as part of a school linking project with an English-speaking country. Pre-intermediate level – Young learners. TASK: students work in groups to research the biography of a writer (from their country) they’ve chosen and create a poster using Glogster – this stage can be spread over a couple of lessons. Then they share their posters with other groups. Students incorporate appropriate changes in their Glogster posters before uploading them to a class wiki and sharing with the linked school. As you can see there is room for both reactive and proactive language input as well as teacher-fronted language work within communicatively negotiated interaction in TBL. Moreover, Ellis (2003) stresses that in order to promote language acquisition tasks need to have a communicative as well as a linguistic focus. Unfortunately I have not gathered from Anthony Bruton’s articles (which are soundly researched by the way) what his views on language are. Nor have I observed him teach. But the way I see it, the task cycle perfectly fits the lexical view of language and language teaching Hugh espouses - as do I since I’ve always considered him to be my mentor. Unlike TBL, the Lexical approach is often criticized for the lack of clear instructional sequence (see, for example, this Scott Thornbury's article), which is perhaps the unfortunate reason why it has never been taken up by the mainstream ELT. Hence Hugh Dellar’s criticism of the paradigm perfectly compatible with and suitable for lexical teaching came as a surprise to me – unless I grossly misunderstand the TBL framework. Hmmm.Great post but in the 100+ TBL lessons/Activities I've done most students get obsessed about achieving the task and really don't see the point in listening to someone else do it. Perhaps in a linguistically minded or very serious learner class it may work. This is a constant criticism of TBL. I also remember seeing a video by Nunan where he gets some students to do a task and they just can't because they don't have the resources. A lot of my students prepare some input then practice as opposed to testing then input as TBL seems to be. Thanks for visiting my blog, Phil. If students don't have the linguistic resources to complete a task, it means the task set is too high for their level or they need some kind of input first. Input in TBL can also occur before the task cycle and that's where I disagreed with Hugh Dellar who claimed that it can only be reactive after you've uncovered the gaps in students' knowledge. I'm persistant. I've done the language before, as is often the way in many BE books, after, during a TIME OUT, a lesson later on, via a recording of their task etc etc. The problem is the whole purpose of tasks in that they are aimed at doing something as quickly as possible but it is trickery as you are just asking them to practice or demonstrate linguistic capability. Students don't often like this idea. Many of mine want to do the task and finish it but convincing them that the process is the point and that afterwards we'll look at and improve their skills is tough. For them, if they managed to complete the task then they have sufficient resources. Reviewing it and even redoing it seems strange. I much like the idea of negotiations where groups take breaks and then I/we discuss how things went, work on language to help them and then return to the negotiations. This is a 'when needed' context. If you just do a focus activity after a text then you need another activity for practice but it often tends to be either 1)fake and just for practising X language 2)another task thay you hope they will not get carried away with and hopefully utilise the language you only told them about 5 minutes ago. This used to drive me bonkers.I've posed this problem to DELTA, MA and even Phd tutors and everyone just says they have the same problems and more time is needed for learning/absorption perhaps. So, in the DELTA module 3 I started setting focus/extension activities for homework which followed a task. Then I provided a new task in the next lesson. This seemed more practical but relies on students DOING homework which is not always a great idea mate. Thanks again for the great post Leo. As I may have said, I've always loved TBL but project-based stuff even more so. Thank you very much for the great post. I would like to comment that as EFL teachers our task is to enable our students to use the language we teach, and therefore we should provide opportunities to do so. TBL is such an opportunity and thus should be used. However, I am convinced that an authentic task should be carried out only after our students had sufficient more controlled practice with the language aimed at, otherwise it would not serve as effective practice. Thanks to your blog I was able to get updated on the whole Dogme issue. I agree with you that TBL lends itself to lexical teaching and I think that you provide clear examples of how. Thank you, Dominique. I am glad your Dogme update came from a non-Dogmetician like me! Thanks for the post. There are so many quality posts around at the moment, I think I'm going to have to take a break from reading soon and digest what I've learned from reflecting on what's been written. 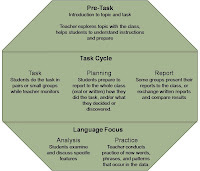 I like task based learning and the ideas behind it and it's great to read the examples here. I really like the idea of slipping pieces of paper (I do like pieces of paper ;-) ) to the learner although I think I'd be inclined to write a reformulation of what the student is trying to say for their use in the reporting stage. You don't explicitly mention the planning and reporting part of all the tasks. That may be because you wanted to keep it short, but these for me are two of the most important elements of the task cycle - along with the language focus. I think it's at these stages where students can be pushed to go beyond what they can already do and where students can get the language when they actually need it, rather than after. One thing that I think Hugh Dellar said was that students aren't required to use particular language to accomplish the task if they don't find they need it and so may get by on what they can already do. I think that this is an important point and one we need to keep in mind. Tasks should be designed to push students beyond what they can do easily and students should have access the language they need - from the teacher, dictionaries, books/internet, language from the pre-task, even their notes from previous lessons, etc. Tasks need to make them struggle a bit to express what they want to - in a safe, encouraging environment. It seems to me that whatever helps the learners learn, if we (and they) believe it does, is what we should be using. I saw one extraordinary statement recently in a comment saying that the person had seen a lot of good teaching but no learning was taking place. I saw something similar soon after. Do people really think that? Can it be good teaching without learning taking place? Does it mean that we do what we've been trained to do but don't take account of the learners? I can't quite get my head around that. Sorry, I've rambled a bit but thanks again for making me think! Thornbury, S. (2001) Uncovering Grammar. Macmillan. You're right. I didn't explicitly mention the planning stage but there is a reporting stage in Example 1 ("students report to the rest of the class") and Example 3 ("they share their posters" - should have said "presented"). There are no overt planning/reporting stages in Example 2 so it probably resembles more the Test-Teach-Test sequence. I also didn't mention reformulation of students sentences because I would ask students themselves to correct them before repeating the task. Students indeed tend to fall back on what they already know and it is difficult to push them out of their "comfort zone" and experiment with new language - I'd say this mainly happens at post-intermediate levels. I agree with you that we should try to help the learners learn in ways that are useful to them and good teaching is finding out what those ways are - isn't it? I'm not sure exactly what the people making those comments meant and can't find the comments now. They just struck me at the time. Fair points, Dominique and Carol. I tend to agree with Carol that learners don't learn what teachers teach but I also agree with Dominique that they do learn something. I just wanted to clarify slightly. I didn't judge that no learning had happened and I would actually imagine some did - perhaps as you say, not necessarily what the teacher was aiming for. Well, I'm very flattered both by the fact that I'm regarded as a mentor and also by the fact that my blog posts prompted one of your own. I have to say, none of what you've really said makes me warm that much more to the whole TBL construct though. I'm all for part of an course involving students learning how to have particular kinds of conversations - whether or not you'd term those 'tasks' I guess depends on what you define a task as. I don't see them as tasks as such. If you take the kinds of can-do statements the CEFR encourages us to teach towards, they are sometimes functional and pragmatic and thus more task-like, but equally are often more social and phatic and interactional. I think PART of any course has to be geared towards teaching these things, and as I'm sure you know, that's what we try to do with the first double-page of each unit in OUTCOMES. Where I take issue with TBL, though, is in the point I made over on my blog - if you know what the task is, and you know the level of your students, why not predict some language that could come in handy first, make that into an exercise, teach the gaps that they students don't know so well and then let students practise using it whilst doing the 'task'? I agree with Phil above that for many students simply doing the task is paramount, and they lose interest in hearing others do it or redoing it themselves. I've always found input works better if it's given before a task, if you want it to be used. This doesn't mean I don't believe in ALSO reworking students' output during the task and giving feedback / more input based on that during my round-up; just that I don;t see this as the MAIN bulk of my language input, but a secondary source. I'm not knocking any of your lessons above. They all look fine and contain some good language. However, if I was personally going to do a lesson designed, say, to help students be better able to write a biographical poster, I'd FIRST want them to read a model, and I'd then use that model to lead into some language work of chunks that might be useful across a range of possible life stories, depending on level. I'd want this to be in exercise form, rather than a list of possible sentence starters for them to use, so I could see how well they can use it already, which chunks cause issues and need further work on, etc. and I'd THEN get them to make their own. I'd still do correction work, feedback, etc. but I just find students do better, richer work if they've had input that links directly to the outcomes we wish them to be able to achieve. Thank you for dropping by and contributing to the discussion, Hugh. I like your idea of doing some exercise with the language rather than presenting a list. And I also agree and see nothing wrong with predicting the kind of language students may need to perform a task or engage in a conversation or role play and feeding it in before they set off. But I wouldn't follow the same model of pre-teaching language EVERY time and return to a convenient but flawed PPP model. In any case, I think different language and different levels would demand different lesson models. Hope all is well and that you are gearing up for some happy holidays! As I reread my comment, I see I failed to say what an excellent post this was, and that it also helped me get a good feel for TBL and other projects I might want to try this semester. Thanks for the inspiration Leo! Thank you for reading the post and taking time to comment! I will be honoured if you include a link to this post. I just wanted to stress that this is just one view of TBL (mine) and other interpretations can have a different take on it. P.S. NEAT... That's a NEAT name for a test! Here, in Israel, they've just introduced ASK (Assessment of Speaking Kit) in the Middle School and ABLE (Assessment of Basic Literacy in English) in the Primary. Am searching for good spoken English class in Chennai. Saw this page Top 10 Spoken English training centres in chennai on net. Is this good one.? One word leads to ... or you've been primed!